Transfixed into thinking like an artist by David Hockney’s Untitled, 992, David Robinson wonders what book opens out its own creation as perfectly as that artwork? In Kirsty Gunn’s new novel Caroline’s Bikini, a novel about writing, he discovers the nearest thing in fiction to watching Hockney’s cactus materialise in front of him. One Friday afternoon a couple of weeks ago, in England’s May heatwave, I visited the new David Hockney Gallery at Bradford’s Cartwright Hall. His early drawings of the city we both grew up in made me feel nostalgic, his dreamy Californian swimming pools and East Yorkshire landscapes were equally enchanting. But there was one painting that I couldn’t move away from. Untitled, 992 is actually a relatively undistinguished Hockney from 2011, a still life of a cactus in a small plant pot placed in a purple mug in the middle of a wooden table. What transfixed me was that, on the screen in front of me, it was changing: the still life was becoming alive. The rim of the plant pot caught the light and turned silver, the handle of the mug darkened into shade, the spikes of the cactus were dotted into existence, lines of wood grain suddenly materialised, the plant pot dulled first into earthenware brown and then reddened into plastic. Each stroke of the brush – or more likely, because this was an example of Hockney’s iPad art, each touch of his fingers – changed the picture, each mark an attempt to capture the moment of seeing. As each of Hockney’s decisions appeared on the screen, they tested themselves against my mind too: wasn’t that silver light a bit too obvious, the grain of the wood too red, the green of the cactus too luminous? I’m not an artist, but suddenly I was thinking like one. What, I wondered, was the nearest thing that fiction could offer to that small epiphany in a Bradford gallery? What book opened out its own creation as perfectly as Untitled 992? 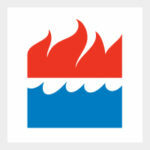 Fiction about fiction gets a bad rap. We’ll lap it up if there’s a writer-narrator with a chunkily plot-rich life like Logan Mountstuart in William Boyd’s wonderful Any Human Heart. We’ll shower awards (and, come the film version, Oscars) on novels like Michael Cunningham’s The Hours which mix scenes of an actual Famous Writer at Work with parallel fictions. Search out the absurdity of the writer’s life and add a twist of a satire on campus life – Michael Chabon’s Wonder Boys, in other words – and readers will love you for it. But writers writing fiction about writing? Nah, we tend to think. Too limiting Too unimaginative. Too much of a cop-out. Actually, I’ve only just discovered the nearest thing in fiction to watching Hockney’s cactus materialise in front of me, and it’s just the opposite of that. Kirsty Gunn’s latest novel, Caroline’s Bikini, is indeed all about writing. If you’re expecting a conventional predictable novel, you’ll realise you’ve come to the wrong place as soon as you read its sub-title: “An arrangement of a novel with an introduction and some further material by Kirsty Gunn”. 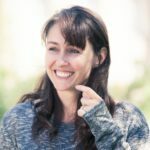 The novel is ostensibly by Emily Stuart, a freelance copywriter/cataloguer/reviewer/short story writer living in London. Her childhood friend Evan, now a middle-aged banker, has returned to Britain from America and fallen in unrequited love with Caroline, his landlady in Richmond. He wants Emily to write the story about that love. The two friends meet in a series of achingly trendy metropolitan gin bars, and Emily’s book starts to take shape. But is it, in fact, going to be a novel? Maybe it might be an essay, a meditation on courtly love, that peculiarly way early medieval man found to put women on poetic pedestals; there are indeed parallels between that and Evan’s feelings for Caroline. At this stage in Emily’s book, everything is still provisional. She worries about it, aware that it might need major modifications, like Hockney changing the colour of the cactus plant pot. One thing’s for sure: if it doesn’t capture some sort of emotional reality it will end up as much of a failure as a still life that doesn’t capture light. Yet to get emotional reality, Emily needs detail, texture, speech to flesh out Evan’s infatuation with Caroline. She wants to explain it, to understand what fascinates him about her. But Evan, tongue-tied in front of his landlady, doesn’t have the words for any of that, or rather the ones that he does have are words other people have used, and wildly overblown, like myths or bad poetry. And here, Gunn implies, we slam straight into one of the key problems with the pre-modernist novel, which is what, even now, most of us still expect a novel to be. In it, fiction usually double-crosses reality. For example, Emily needs to know, with some degree of precision, what the inside of Caroline’s house looks like; all Evan comes up with it that it’s “fancy” so she starts using her imagination. She wants to know how Caroline talks to him, so she can at least use the odd adverb; he can’t remember. Even when he does come up with his own description of his commute, the words he uses sound more like John Cheever’s than his own. So far, so Hockney: as Emily and Evan drink their way round London’s gin-joints – invariably described with comic brio – Emily’s experiments with words (what works, whether real dialogue is good enough etc) appear and disappear like iPad finger-painting on a screen. If Hockney makes you think like a painter, Gunn makes you think like a writer: Emily’s doubts about whether her book has enough “ballast” perfectly convey a novelist’s doubts about the impossibility of her craft. The real skill of Gunn’s novel, however, lies in the way in which it takes the reader off in completely different directions. I should explain. As well as satirising London’s moneyed elite (the kind who hold swimming pool parties), Gunn has constructed a 60-page afterword which contextualises the novel “by Emily” which we have just read. If you’ve missed all those references to courtly love, and to Evan wasting away as knights tended to do in what was, after all, the way the West first attempted to put romantic love into words, she offers chapter and verse on, for example, Petrarch and Laura. If you want more background on the childhood friendship between Emily and Evan, and that between their two families, or how both of them use words, those bases – and many more – are covered too. Much of this superstructure – and indeed the book’s very title, seems designed to back up the story of whether Evan will ever discover the secrets of Caroline’s bikini. Yet Gunn has been carefully laying out another trail all along. I’m not saying you won’t guess where it will lead, but even if you do, this book is written with such wit and panache that you won’t mind. Its magic is simple but powerful: you might think you’ve been looking at a potted cactus, but it turns out that really you’ve been watching an apple tree all along, maybe even a small orchard. And not even Hockney can do that. 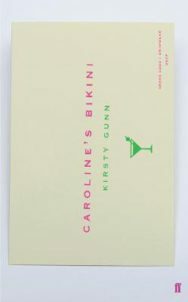 Caroline’s Bikini by Kirsty Gunn (Faber & Faber) is available now priced at £14.99.